For all the music lovers out there, we know you love to stock up your iTunes library and listen to the songs every now and then. But you don't always need to spend your hard earned money to get iTunes music downloaded to your iTunes library. We have brought to you the top 5 methods to get free iTunes music. Now, if you are looking for the same, then you have fallen to the right place. Let's uncover the ways with which you can get free iTunes music downloaded. This section encloses 5 proven ways to download iTunes music and that too for free along with their step by step tutorial. Though this first method is quite time consuming but this certainly is worth it. Look out over the internet for some free music websites. For instance, websites like MP3XD, MP3juices, Zing MP3 or Emp3z are some of the examples that can help you to get free iTunes music. Here's what you need to do in order to download iTunes music for free. Note: Please remember these websites shoots a lot of pop up adverts on your screen that may annoy you and make this process a little difficult for you to perform. Step 1 – Visit the free music provider website and then search for the desired music track or album. Step 2 – Open the preferred link of the album or your music track out of the several results that you'll get to see on the upcoming results page. Step 3 – Lastly, verify if the sound track is what you were looking for and then hit the Download link/button. Caution: Please ensure to click on the correct 'Download link/button'. Because these sort of websites have many deceptive buttons that looks quite original and may lead to another website which could be unsafe or harmful to get on. Or, often times it can also lead to installing crapwares over your computer. Unlike the first method, this next method is absolutely safe as we are going to download the music from iTunes itself. So let's understand how to get free iTunes music with the below mentioned guide. Step 1 – First, head over to the iTunes homepage and scroll down to the bottom where you'll find a section named as 'Free on iTunes'. Well, yes, there's whole new list of free songs and other data which gets updated over iTunes every single day. Step 2 – Now, browse the 'Free on iTunes' section to get your free iTunes music downloaded to your library. You can also get free iTunes music by using the Music-oriented Podcasts as well and this is the next method that we are going to explore. Step 1 – Boot up the iTunes app on your PC or iPhone and then visit iTunes Store. Tap on 'Podcasts' using the navigation links available at the top. Step 2 – Then, you need to look for music-oriented podcasts. To look for it, hit on the 'Podcast Quick Links' from the right and select the 'Music' option from the drop down menu. You can then browse for your desired songs and get them downloaded to your library for free. A yet another way to get free iTunes music is via the Starbucks trending promotional offer, i.e. 'Pick of the Week' gift coupons. Here's how to get this into execution. Step 1 – Acquire a 'Pick of the Week' song card to redeem it on iTunes. Every song card has a unique code on it which usually values .99 to redeem. Step 2 – Next, visit the iTunes store homepage and using the quick links, redeem your song card. 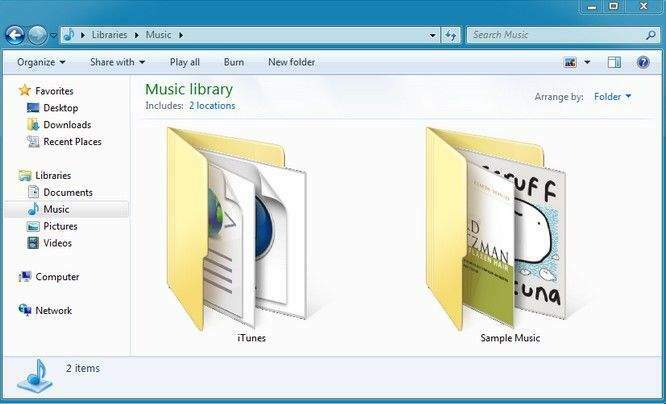 Once you're done with it, browse for your desired music file and get it downloaded and saved into your library for free. The next method we have for you to get free iTunes music is via the YouTube website. This method is a bit complicated but certainly helps you to get any desired song for free. Here's how to do it. Step 1 – Visit YouTube and browse for your desired music track. Now, copy the website URL from the top. Step 2 – Next, search over Google for a reliable website which converts YouTube links to a music file. Then, paste the copied URL over the field provided on the website and get the converted music file downloaded to your PC. So you've got the free iTunes music downloaded to your PC but how do get that music transferred to your iDevices from your computer? Introducing, Tenorshare iCareFone, a powerful tool to efficiently transfer your music or other files on your computer to any of your iDevices (or vice versa) in just a matter of single click. With this mighty tool you can also perform selective or complete backup and restore operations. Moreover, you can also manage your data over your iDevice with its unique file management feature. Here's what you need to do in order to transfer downloaded music to your iDevice. Step 1 – First, download the Tenorshare iCareFone software and get it installed over your computer. Launch the tool and select the 'Manage' tab from the navigation bar at the top. Step 2 – Next, select the 'Music' bar from the category section on the left. Then, to transfer music files from your computer to your iDevice, hit on Import button then locate the desired music files over the local storage. Lastly hit 'Open' and you're done. We are now positive that you have full understanding with the best ways to get free iTunes music and how to get the music transferred to your iDevices using the recommended tool, i.e. Tenorshare iCareFone and that too with just a matter of a single click.